Although blue light-emitting diodes (LEDs) have been commercially available for many years, there remains a lack of understanding about how they actually work. However, a new study from the UK has sought to explain why their manufacture is problematic, and demonstrated a way of improving on them. To achieve this, a team from University College London (UCL), with colleagues at the University of Bath and the Daresbury Laboratory, explored the complex behavior of gallium nitride (GaN), the key component of blue LEDs, using sophisticated computer simulations. Their study, as reported in Physical Review Letters [Buckeridge et al. Phys. Rev. Lett. (2015) DOI: 10.1103/PhysRevLett.114.016405], was based on research into the fundamental properties of a wide range of semiconducting and insulating materials, especially wide-gap semiconductors such as GaN where the balance between mobile charge carriers and lattice defects is not well understood. 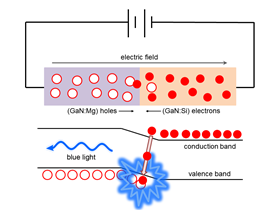 GaN has a large energy separation (‘gap’) between electrons and holes that is critical for tuning the energy of the emitted photons to produce blue light. The team devised a solution of applying hybrid quantum and molecular mechanical modeling from research into models with different parts of a complex chemical system simulated by different levels of theory. This showed that when a magnesium atom is added, it replaces a gallium atom and does not donate the positive charge to the material, but retains it. It also demonstrated that the behavior of the semiconductor is more complex than previously imagined, as well as explaining the need for so much magnesium to develop blue LEDs successfully. The scientists now hope to examine heavily defective GaN and other doping strategies to improve solid-state lighting, as well as better understand how the hole-trapping energy changes. Another step could be to apply their approach to the closely related material zinc oxide, as it should be suitable for accurately modeling charged defects. Computer models show that the right mix of hydrogen bonds is critical for producing polymer and cement composites that are strong, tough and ductile.